This is something you hate to see. 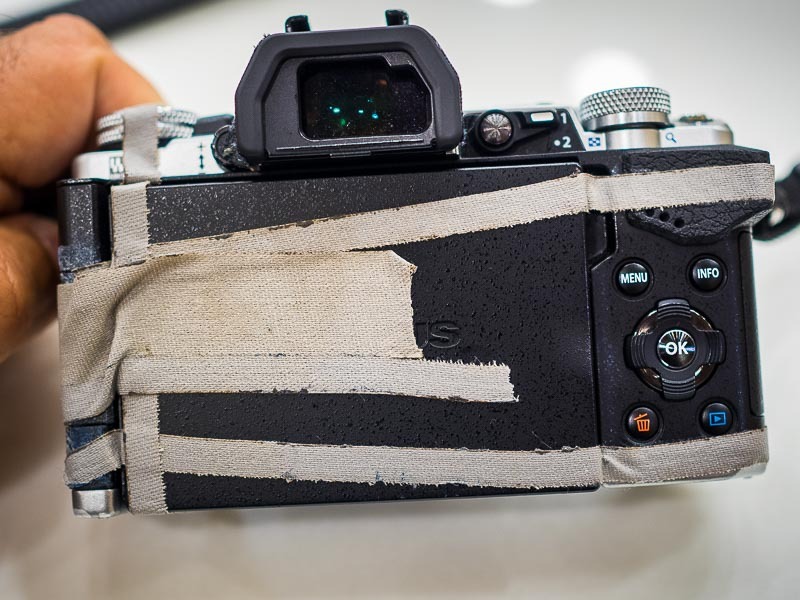 My relatively new Olympus OM-D E-M5 Mark II held together with gaffer tape. One of the features of the E-M5 Mark II is that the LCD on the back swings out and is fully articulated. On the full frame Canon bodies that I had been using, the LCD was fixed to the back of the camera. On the Olympus E-P5 it was hinged so you could tilt it up and down but not swing it around. On the E-M5 Mark II, which has a lot of new video features, it's fully hinged, which is an advantage when you're recording video. From the day I got the E-M5 Mk2 bodies, I've been a little nervous about damaging the articulated LCD. The articulated screen has some advantages but I was worried about banging it into something and breaking it. Earlier this week, I was covering a demonstration in defense of students arrested by the Thai government. There weren't many protestors at the demonstration - there were probably nearly as many journalists as there were protestors and we (the journalists) were all vying for the best images. I was making some "Hail Mary" type photos in the middle of a crowd of other photographers and videographers. The screen on my camera was extended so I could see what I was doing. I heard, rather than saw, something crack and the screen fell off the camera and was dangling from the camera (but still working). I stepped out of the media scrum grabbed the gaffer tape I always carry and taped the back to the camera. A quick check showed the rest of the camera was fully functional, so I taped up the back and went back to work. The Olympus service offices in Thailand are, conveniently, on the street we live on. I stopped at Olympus on my way home to drop off the camera. The service technician looked at and said, "How did this happen?" I took that as more of rhetorical question because honestly, I don't know if I bumped into someone, if someone bumped into me or what happened. They told me the repair would be 4,000Baht (about $117US) and the camera would be ready Friday. I stopped by the repair shop this evening on my way home and my camera was ready early. Olympus gives you the old parts when you get something repaired. This is my old LCD. 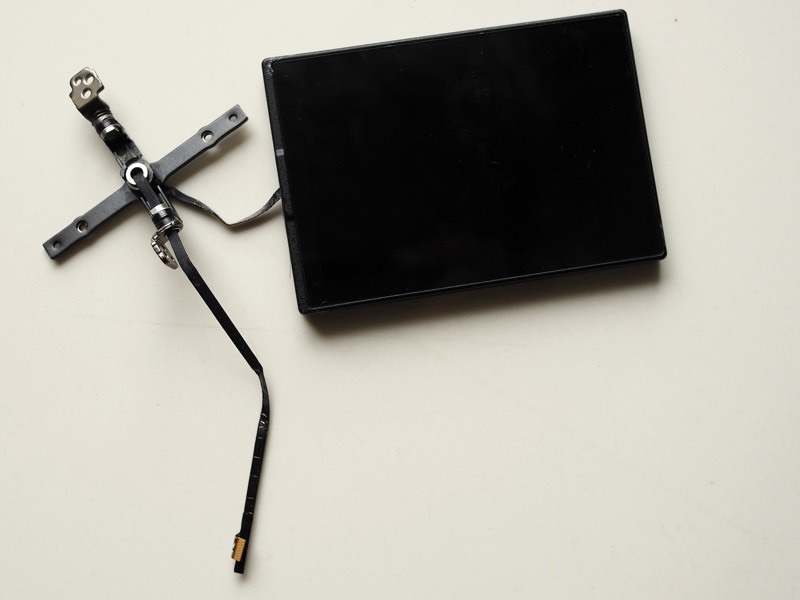 The part that actually broke is the hinge assembly on the left side of the photo. I can't complain about Olympus' service. My camera was ready early and it cost exactly what I was told it would. But I'm going to be more careful with the LCD in the future.